Emotionality has long been recognized as a crucial ingredient in human beings. A good connection with emotionality is essential; it is highly complicated and dynamic in human life. It can never be fully explained or analyzed by rational analysis and measurement of emotions. The writer has published a book `Emotionality and Mental Illness: A Multi-dimensional Modelâ€™ in New York: Nova Science in 2012 in which various perspectives in emotionality are described. It is also related to oneâ€™s meaning of life, self and ego strengths, mind, body, behaviours and deeds, interpersonal relationships, roles and social functioning. Then, a multi-dimensional model in terms of feeling, mood, affect and sense is constructed to interpret the emotionality of persons with mental problems is also described. This book is an extension and elaboration of the above mentioned book and a two volume set. Volume I is a further refined articulation of emotionality in severe mental illness. Based on the multi-dimensional model of emotionality in terms of affect, mood, feeling and sense, the writer tries to interpret and intervene with the emotionality of severe mental illnesses such as the blunt affect of schizophrenia, feelings of anger in major depressive disorder, a dissociative sense of fear in post-traumatic stress disorder and the lonely mood in borderline personality disorder. In this book, the writer begins each chapter with a focus on the various perspectives of a specific type of mental illness. Based on these perspectives, the writer attempts to integrate these perspectives with related concepts in emotionality hoping that it can provide a humanistic, yet pioneering, platform in interpreting and intervening in persons with severe mental illnesses. 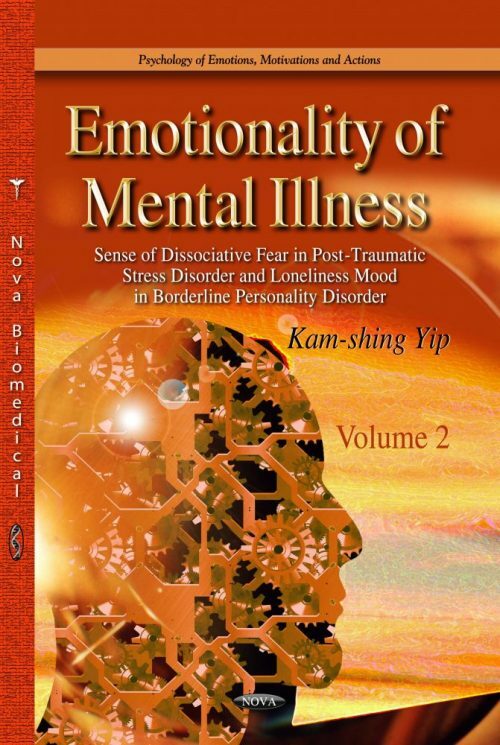 Volume II is a further refined articulation of emotionality in severe mental illness. Based on the multi-dimensional model of emotionality in terms of affect, mood, feeling and sense, the writer tries to interpret and intervene with the emotionality of severe mental illnesses such as the blunt affect of schizophrenia, feelings of anger in major depressive disorder, a dissociative sense of fear in post-traumatic stress disorder and the lonely mood in borderline personality disorder. In this book, the writer begins each chapter with a focus on the various perspectives of a specific type of mental illness. Based on these perspectives, the writer attempts to integrate these perspectives with related concepts in emotionality hoping that it can provide a humanistic, yet pioneering, platform in interpreting and intervening in persons with severe mental illnesses.